Leaders' actions can have consequences opposite to those they intend. These unintentional results are difficult to detect, understand, and change. Consequently, leaders' actions tend to persist resulting in further unexpected outcomes. This can create a vicious cycle of leadership failure. With all their best efforts, strategic, financial, scenario, human capital and operational plans in place, they fail. Unaware, they self-sabotage and sabotage others; again, the result is unintended consequences, no matter how hard they try. This book gives a glimpse into why and how this happens, and what to do about it. 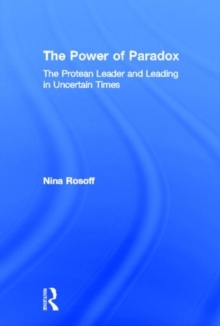 Understanding the Power of Paradox can empower leaders in uncertain times. 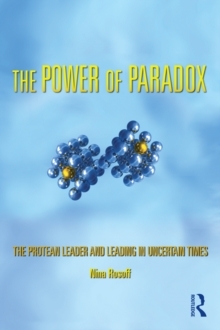 Paradox reveals uncertainty giving leaders room to breathe and time to think, better able to deal with ambiguity and manage complexity, no longer stymied. Learning to think differently and behave with capabilities, you already have, more resilient, adaptive and flexible leaders execute conscious actions effectively, inspire and empower others, creating the consequences they intend, successful Protean Leaders.